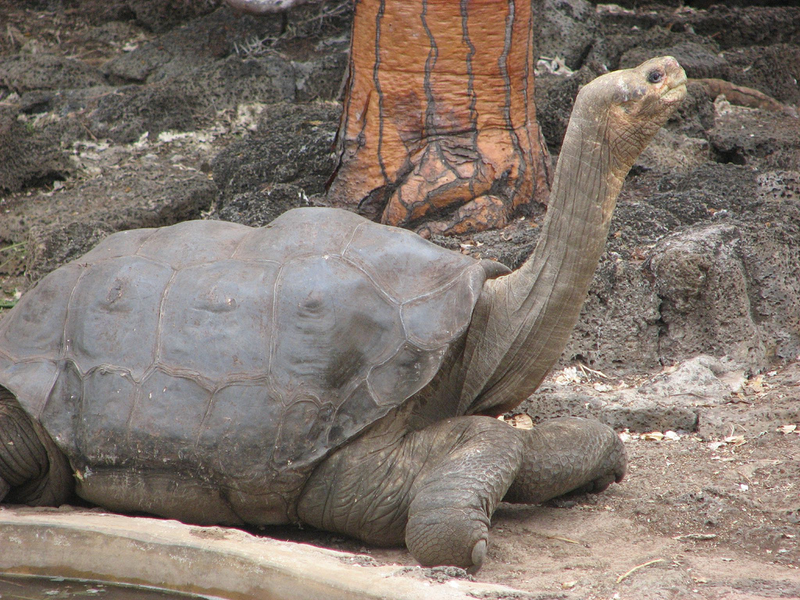 Lonesome George is the last known living individual of the Pinta Island Tortoise, which is a subspecies of Galápagos tortoise, native to the Galápagos Islands. He is regarded as the rarest creature in the world. George has become an international symbol of survival and is an important leader in the animal conservation effort. He is estimated to be 60-90 years old and is currently in good health. George was named after the 1950s American comedian George Gobel. On December 1, 1971, he was recovered from the Island of Pinta by the American malacologist Joseph Vagvolgyi. During the 20th century, Pinta Island’s vegetation was devastated by the introduction of feral goats. The indigenous tortoise population (Geochelone nigra abingdoni) was reduced to a single identifiable individual, George. After his recovery, George was penned with two females of a different subspecies. Many attempts to produce an offspring have been made, but so far no babies have been hatched. The effort to exterminate goats from Pinta Island is complete and the vegetation on the island is starting to return to its former state. Recent discoveries made on the neighboring Isabela Island have revealed a species of tortoise that is a mixed race of Pinta ancestry. This suggests the presence of at least one Pinta tortoise near Wolf Volcano on Isabela Island. More research needs to be conducted in order to identify this tortoise among the 2,000 living on Isabela. Another possible pure breed Pinta Island Tortoise candidate named Tony lives in the Prague zoo. Peter Pritchard, one of the world’s foremost authorities on Galápagos tortoises has found the shell on Tony to be extremely similar to that of George and the Pinta shell specimens. To date, the official classification of Tony has not been released by the scientific world. There is currently a reward of $10,000 for the discovery of a female Pinta Island Tortoise.